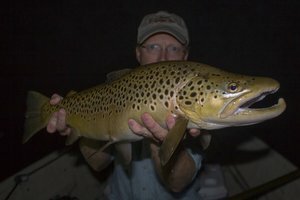 The Trout Zone: Caney Finally!!! The Caney was finally fishable to wade fisherman after weeks of high flows. I arrived at the dam around 1:30 Sunday afternoon hoping for a good hatch and some active fish. After gearing up, I walked down the trail to the wooden steps and made my way into the water. There were already several other fisherman working the off-color water so I moved further downstream to get some distance. Finally, a couple of splashy rises got my attention so I paused to rig up. After being away from the river for so long, I decided to go back to my favorite rig, a dry and dropper. My starting dropper on the Caney is normally a Zebra midge, and I wanted to try a new color combination. The stained water made things a bit difficult, but I quickly developed a routine. For the rest of the day, if I found a consistently rising fish, then I could generally get it to eat the midge. Here's an example of the water where I was finding fish. A sparse hatch of blackflies was in progress when I arrived on the river, and it appeared that the fish were keying on the insects as they fluttered across the surface. 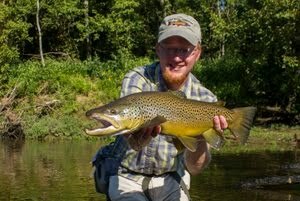 My dry fly was a little too large to get their interest. However, once the water clears and the fish start keying on adults, I will be casting tiny dries to Caney Fork fish sipping adults or emergers in the film. The river is still very off-color, and I'm a little concerned about the health of the fishery. However, over the course of the 3 or so hours I fished, I managed to catch several and also saw a few larger fish. I'm guessing the turbidity of the water is at least partially due to the continuing efforts to reinforce Center Hill Dam. 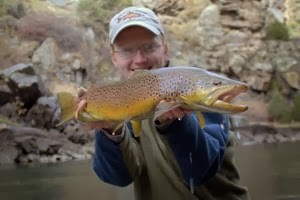 If we continue to see some low flows on the river, the fishing should improve. 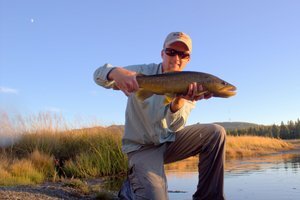 In general, the first few days of lower flows provide slower fishing as the fish get accustomed to the change. 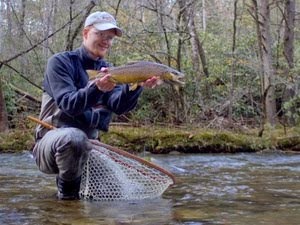 Once the flows stabilize, the fishing should turn on. Hopefully the water will clear up as well which should help tremendously. Glad you were able to get out there. I hope to head over that way sometime this spring, I will give you a shout when I do. David, I know that you consider the Caney your "home" river and so do I...hell I've spent enough time there. So I am also quite concerned with the health of this fishery. As you stated, I think we will have to wait around for the constant summer levels to see if their has been any damage done. I will say, from my winter fishing experiences there, the fishing has been sub-par. I have always had some of my best fishing on the Caney in the winter, but this season I struggled. I hope for the best though, and thank you for the updates.